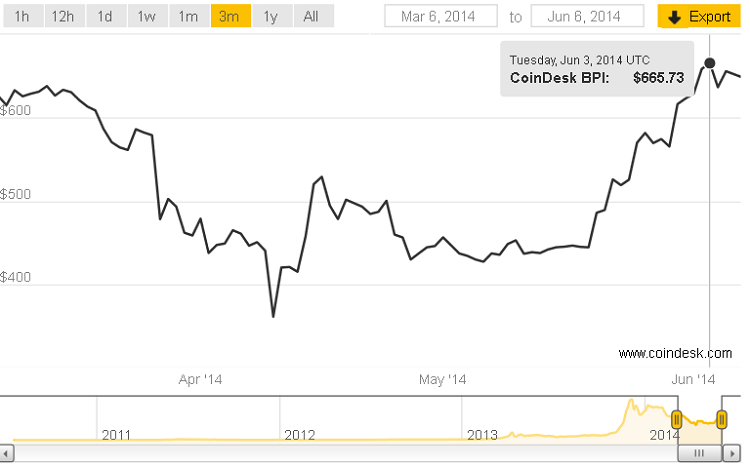 Bitcoin prices have recovered from late Spring lows hit during the shutdown of Mt. Gox and Chinese exchanges struggling with more limited banking ties. As bitcoin again proved resilient in the face of such challenges, more positive news is driving a resurgence in prices—there is the growing certainty in regard to taxation and regulation as well as trends toward larger companies embracing the technology, for instance. More importantly though, the trends in usage growth, particularly web wallets, continue to show astounding growth, and reacting to this popularity, Coindesk also reported bitcoin VC investment this year already 30% higher than 2013’s total. The past month has also seen growing acceptance toward bitcoin among leaders of industry in banking, technology, and payments which have long been reluctant to embrace it. In the last week, both Facebook and eBay have announced their intention to integrate digital currencies into their platforms. Facebook plans to integrate digital currencies into a tipping app. At the same time, eBay’s CEO also discussed its planned integration into subsidiary Paypal. There is an aire of inevitability, due to the rising popularity of digital currencies. However, when and if that comes to fruition, the limited use cases for digital coin on eBay would likely expand into use for actual payments on the site, at least through Paypal. The fees available through an increased user base may be looking more lucrative. One recent report from Mary Meeker of Kleiner, Perkins, Caufield, and Byers (KPCB) has done some very good research into the “extraordinary” growth of interest in bitcoin on the Internet. In particular, she cites the 8x growth of web wallets creation in the last year alone. The full slideshow report is available here. Though the Mt. Gox saga hasn’t been grabbing as many of the headlines, there was another report of interest on the recent controversy over a bot named “Willy”. The suspicious behaviors attributed to the automated trading programs led to speculation that prices were deliberately manipulated higher last Autumn, through the Mt. Gox exchange or even by the exchange itself. The full report which led to much speculation in the forums is available here. Though this report highly speculative, it’s interesting in the aftermath of a collapse with 100s of millions of dollars at stake that savvy Internet folks have been attempting to piece together a narrative of the mysterious collapse of the once-leading bitcoin exchange.